The purpose of this case study is to shed light on a huge problem currently plaguing the outdated but vital prescription medication system, and share how the application of blockchains can be used as a solution. Forms of bookkeeping and recordkeeping have evolved over time across various industries. In developing countries, government data is (mostly) held online in databases using traditional contracts. There is, however, a sense of significant urgency within the medical community to develop superior recordkeeping systems because of the industry’s incredibly low tolerance for error. According to recent studies, medical errors kill more than 250,000 US citizens annually. This makes medical errors the third leading cause of death in the US. Your Health Care May Kill You: Medical Errors. - NCBI. BlockMedX offers a solution in the form of a platform that enables and encourages physicians and pharmacies to establish a professional relationship not only with each other, but with their patients as well. This token-based economic system, made possible by blockchain and Ethereum technology, will only replace one part of the system that creates a disproportionate amount of addiction issues. In actuality, the problem is much broader. So, in order to understand the true importance of the blockchain solution that BlockMedX and Bitsapphire have created, we must first give a clear description of the issue. The first section contains an overview of the war on drugs and the opioid epidemic in the US. The second section discusses BlockMedX and the platform, the technology behind it, and Bitsapphire’s methodology. On October 27, 1970, President Richard M. Nixon signed the Comprehensive Drug Abuse Prevention and Control Act of 1970, a federal law that required pharmaceutical industries to maintain records for certain drugs. Substances in this schedule have no accepted medical use and a very high potential for abuse. Examples: heroin, LSD, marijuana, etc. Substances in this schedule have a high potential for abuse and dependency. Schedule II drugs are the primary focus of this study since they are primarily bought and abused using prescriptions. Substances in this schedule have less potential for abuse but can still lead to physical/psychological dependence. Examples: benzphetamine, ketamine, anabolic steroids, etc. Substances in this schedule have a low potential for abuse. Examples: alprazolam, clonazepam, diazepam, etc. Substances in this schedule have the lowest potential for abuse. A more comprehensive list of scheduled drugs is listed on the DEA website. By signing this act, Nixon declared drug abuse to be “public enemy number one” of the United States, and vowed to destroy international drug lords and cartels in order to cut the stream of narcotics into the United States. This was the beginning of the “war on drugs”. The war on drugs ended up being a complete failure because fighting the supply end in a war of addiction is an unwinnable battle. Additionally, strict enforcement of minor drug offenses all over the United States contributed mightily to racial tensions and gang wars. Drug use is also constantly glorified by media and entertainment, driving a culture of addiction. In 2005, the DEA had a budget of USD $2.142 Billion. DEA.gov / DEA Staffing & Budget. By dividing the price of drugs seized by the estimated total spent on illicit drugs, we can assume that the DEA had a 0.4% efficiency rate when seizing drugs in 2005. Drugs, like any other product, abide by the fundamental economic law of supply and demand. This law states that when supplies decrease it will lead to an increase in demand, higher prices, and poor market performance. But, people will always buy drugs because the means of production will merely transform themselves. The beginning of the drug era was booming, and led to the construction of large laboratories on U.S. soil. After the controlled substances act tightened restrictions even further, and prohibited more chemicals, most of these labs were shut down. This created an opportunity for dealers to produce their drugs in small-scale operations (think Breaking Bad). The issue with small-scale operations is that there is an ever larger incentive to make a profit due to much bigger competition. These small-scale operations did not have professional chemists on their teams, instead opting for a “bootleg” approach where recipes were altered continuously to make more profit. This usually led to stronger doses because of the synergistic or antagonistic effects of drug interactions. After these small-scale operations were shut down, the process moved to neighboring South American countries. From here, the supply and demand chain continued with transportation methods becoming more and more complex and the drugs becoming stronger and stronger. This history is essential to understanding how the opioid crisis developed. The blame can be shared among pharmaceutical companies, negligible doctors, and the side-effects of the failed war on drugs. While Nixon’s vision of the war on drugs was a strict crackdown on illicit drugs, the opioid crisis actually spawned from the governmental system itself. Before the 90s, doctors held strong beliefs against opioid prescriptions for patients that didn’t have cancer-related chronic pain. These drugs were powerful, addictive, and very little was known about potential side-effects. There are no long-term studies that prove that the long-term benefits of using opioids outweigh the risks, and all randomized controlled trials are short-term. Long-term opioid therapy for chronic noncancer pain - NCBI. A study compiled in 2011 shows that approximately 100 Million Americans suffer from chronic pain (including cancer patients). Big pharma companies exploited this by heavily marketing the message that chronic pain unrelated to cancer was heavily undertreated. The strategy proved incredibly successful, and by the end of the 90s, every doctor began prescribing opioids for chronic pain not related to cancer. 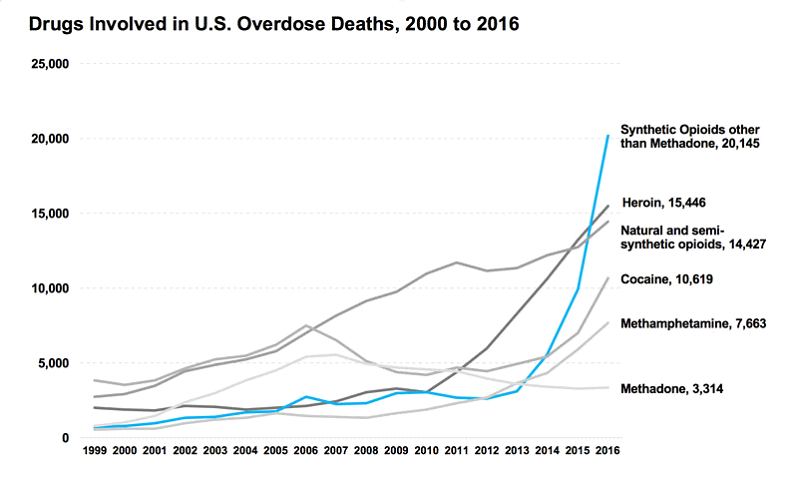 We can see from the above graph that beginning in 1999 semi-synthetic opioid overdose numbers began to overtake heroin, methamphetamine, and methadone. This jump in opioid overdoses coincides with big pharma companies beginning their push of opioid products into the market. It was less addictive than immediate-release opioids. Extracting oxycodone from Oxycontin was very difficult. These statements ended up being false (or exaggerated) claims, and the US Government sued Purdue for USD $634.5 Million. UNITED STATES OF AMERICA v.THE PURDUE FREDERICK COMPANY, INC., ET AL. - Western District of Virginia.But not before Purdue made more than $3 billion USD in profits from Oxycontin. Just like Nixon’s war on drugs, the Obama administration’s plan to slowly cut prescription numbers was the wrong approach. When addicts weren’t given their opioid dose, they turned to the streets for illicit drugs. Addicted users who aren’t given their fix often find other options on the street, such as counterfeit opioids, heroin, or fentanyl. Fentanyl is also known for the extreme reactions it induces. As little as two milligrams can cause an overdose in most people. DEA / Fentanyl FAQThis is big health problem because in the streets it is sometimes sold to customers as heroin, which has a higher “standard” dosage. According to the previous graph, in 2016 there were more than 63,600 deaths related to drug overdoses. The leading cause of overdose was synthetic opioids other than methadone (the category which includes fentanyl), the second was heroin, and the third was semi-synthetic opioids (prescription drugs). In 2016, more people died from a drug overdose than in estimated breast cancer deaths (40,890)  or car crashes (37,461) USDOT Releases 2016 Fatal Traffic Crash Data | NHTSA.. Keep in mind that all of the categories that include natural and semi-synthetic opioids are FDA approved. We believe this drug epidemic is due to a fundamental failure to really understand addiction, which led to abstract methods being used to tackle the issue. The number of “Deaths by Overdose” is still growing year over year, and has been since 1999. Only three US states have a lower number of deaths by overdose when comparing 2016 to 2010: Oregon, Montana, and Nebraska. All other U.S. states showed an increase. Drug Overdose Death Data | Drug Overdose | CDC Injury Center. While searching for blockchain applications that align within the Bitsapphire “framework of operations,” we were presented with a challenge when contacted by BlockMedX CEO Michael J Brunner. Just like with any other issue, we began with a procedure we call “Week Zero.” During Week Zero we examine the issue in front of us and hold daily brainstorming sessions to try and deconstruct as many concrete problems as we can. The length of the process varies from case to case. BlockMedX came to us with a proposed solution for a problem that many citizens around the world face: The medical dispensation system. A data breach within Anthem Blue Cross led to 78.8 million of their customers’ having their data sold online in black markets. This data included names, SSNs, home addresses, and dates of birth. A Medical Informatics Engineering breach affected 3.9 million customers. The breach included personal diagnosis and other highly sensitive data. A Premera Blue Cross hack exposed the data of 11+ million people online. This breach included not only personal ID data but also personal bank accounts. There are various lists available online that detail the multitude of data breaches occurring on an almost daily basis. Medical companies have been under especially heavy fire from hackers using ransomware to obtain and sell sensitive patient data. Blockchains eliminate this risk. The only possible point of failure within a blockchain is human flaw, or a method of social engineering. Proper training can eliminate this risk though, making blockchains completely immune to hacks. This platform is highly secure, HIPAA and regulatory compliant, and used for managing prescriptions. First, the prescription is recorded onto a blockchain. Since the application is regulatory compliant, it includes all the necessary information to create a valid document. Secondly, BlockMedx’s proprietary token, MDX, pairs with each transaction. Physicians will have to pay a small fee to pharmacies. This payment is smaller than what most current traditional forms offer. This also enables us to create a version control for every drug prescribed so that the patient can look back on all of his or her former transactions, this feature will help us see progress. All of this being done in the form of a token creates a stable economy. While the primary focus of the platform is Schedule II drugs, BlockMedX intends to continue expanding and accommodate more functionality. The goal is to create an environment that allows patients full control over all of their prescription data, all from inside one system. When using the application, logins will be performed using a blockchain-based identity. This identity is generated when first creating an account and is unique to each user. A unique identity will be a necessity for any user to utilize the MDX Tokens and interact with smart contracts in the system. Inside the website application, all users will have an MDX balance and the ability to use it to complete a prescription process. Physicians will be able to view each of their patients’ entire prescription history (with the patient’s consent), this information will help them decide the best possible course of action for each particular patient. This blockchain stamping technology is immutable and allows us to create a profile of smart contracts for each patient. This is a great way to get valid data for the patient’s wellbeing. By ensuring that only physicians can sign and transmit prescriptions, BlockMedX secures total integrity. Physicians can also dictate the pharmacy that is to receive the prescription, while patients have the right to re-assign that destination. Physician pays a fee in MDX tokens to write the prescription; a neglectable fee which is cheaper than current methods. The prescription is then signed to verify the credentials. The prescription goes into a “pending” state, waiting for confirmation. BlockMedX dApp checks the transaction and confirms it, changes it to an “approved” state, and writes it in the Ethereum blockchain. Physicians can see a full list of these transactions, including “revoked” transactions. Prescriptions can be revoked while in the “pending” and “approved” state as deemed necessary by the physician (e.g., errors). If this occurs, the transaction will enter the “revoked” state, and the MDX tokens will return to their original wallet. Pharmacies will have to work with “approved” transactions by opening the BlockMedx app. These transactions will contain all the information regarding the prescription, and the pharmacy will be able to see a full list of the patient’s history as well. Pharmacies will then decide to either accept or decline the prescription. Accepting the prescription is finalized with the pharmacy’s signature, then MDX tokens are transferred from the physician wallet to the pharmacy wallet. This signed transaction can also be printed, including a QR code for validating the prescription. Other forms include using the mobile application. Once the process is complete, the transaction will no longer be valid in order to prevent reusing the same prescription. Patients will have access to their data within the application. Using the app, they can scan their QR codes to verify the integrity of purchases from their pharmacy. The application also sends alerts when a new prescription has been created for them by the physician, when it is accepted and filled by the pharmacy, or when they can get a refill. Patients can communicate back-and-forth with physicians and pharmacists to receive updates on their prescriptions, while also participating in medical trial surveys. Since patients are also able to carry MDX tokens, the token economy built into the application incentivizes patients by rewarding behaviors that align with regular checks and refilling. All of these structures are in place to help build a healthier community and more engagement between patients and physicians. Auditors can be any private or government organization that is required to maintain an audit of these transactions. These organizations can be the DEA or any other healthcare organization. The prescriptions that are written in the Ethereum blockchain are auditable, and anyone with valid credentials can access them. Physicians will have a list of prescriptions they have written, and pharmacists will have a record of prescriptions they have received. Any valid third party that requests these records can download them using the BlockMedx platform, downloadable data includes physician practices, pharmacy records, and patient prescription history. Since the drugs that BlockMedX aims to primarily target are heavily abused, the system has a built-in feature that performs predictive analysis on all the chains of the link - patients, doctors, and pharmacists. On account of any malicious activity, the platform will report it to higher bodies. Patients can also choose which third parties their data is shared with, such as healthcare organizations or pharma companies. Data sharing contributions are rewarded with tokens. The proposed solution developed by Bitsapphire and BlockMedx is very straightforward, so the main focus of this study was the underlying problem that led to the opioid addiction epidemic in the United States. This epidemic should not be totally blamed on the drug addict, the very system that supplies and distributes opioids is also to blame. While using blockchains immediately results in improved safety, our application of blockchain technology in this instance has a substantial network effect on the relationships between these three parties (physician, pharmacist, and patient). This is one of the critical features that make BlockMedX so powerful. Bitsapphire’s methodology has helped create an application from an idea. Our platform will help end the opioid crisis while simultaneously correcting the horrible UX/UI practices that plague the current prescription system.